I have joined in with much anticipation to the 9/11 tribute site 2,996: A Tribute to the Victims of 9/11 . I have been assigned to honor the memory of David Fontana, firefighter, New York City Fire Department. I live in NYC but did not know him. I feel a loss that I never met him. I defer to the words of legacy.com which talks about him here. Here are some comments honoring David, many of whom knew him well. His wife, Marian, penned a critically acclaimed work in tribute to him entitled A Widow's Walk, a Memoir of 9/11. The memorial for Dave Fontana is scheduled for Oct. 17, which would have been his 38th birthday. He died at the World Trade Center on Sept. 11, on his eighth wedding anniversary.Mr. 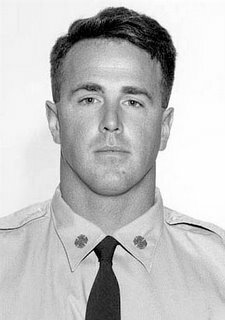 Fontana was a firefighter with the elite Squad 1 unit, stationed in Park Slope, Brooklyn, where he lived with his wife, Marian, and 5-year-old son, Aidan. Neighbors were shocked by the news that 12 men from the small firehouse on Union Street had died, but they took his loss especially hard. Dave Fontana was a man's man. He volunteered his time for the Boy Scouts. He read to children. He worked tirelessly to find the names of firefighters who had fallen in World War II so that dedication plaques could be hung in the firehouses where they had served.A trained sculptor, Mr. Fontana was known for the elaborate Halloween costumes he and his son wore in the annual neighborhood parade. "You know Dave Fontana?" Aidan asked the other day. "I love Dave Fontana." Profile published in THE NEW YORK TIMES on October 6, 2001. NEW YORK CITY - FDNY colleagues found the body of Marian Fontana's firefighter husband, David, deep in the rubble that was the north tower just two weeks ago. It was a poignant compensation for Fontana, who lost her husband on Sept. 11 - the day of their eighth wedding anniversary - and who heads up the campaign on behalf of WTC victims' widows to keep the search for bodies going at Ground Zero. "People thought we were operating on false hope, but I just knew that it wasn't so," said Fontana, 35, of Brooklyn. "I wanted my husband to be found by one of his brothers, not by some Dumpster." As president of the 9/11 Widows and Victims' Families Association, Fontana is one of the many victims of Sept. 11 who have channeled their anguish into activism on behalf of their lost loved ones. Thanks to Fontana's efforts, there's a new, powerful political voice in the city - but nothing makes up for losing the man she'd love since she was 18. The sun sets over the New York skyline as clean up and recovery efforts continue at the site of the World Trade Center disaster, Tuesday, Dec. 18, 2001, in New York. For her, Christmas won't be about eggnog and sing-alongs this year. "For me, there will be no holiday. I'm just going through the motions for my son," she said. And every day, there's the memory of an eight-year milestone missed. If Sept. 11 had worked out the way she and David, 38, had planned, they would have celebrated their anniversary at the Central Park Boathouse and at the Whitney Museum. And they almost did. A little before 9 a.m., David called to say he had just finished his 24-hour shift at Brooklyn's Squad 1. "I'll meet you in 10 minutes," he said. David Fontana, 37, firefighter, accomplished artist, sculptor Date of Death 9/11/2001 Monday, 10/08/2001 Firefighter David Fontana, 37, of Park Slope, Brooklyn, and his wife, the former Marian Goldstein, would have celebrated their eighth wedding anniversary on the afternoon of Sept. 11, the day of the attack on the World Trade Center. Mr. Fontana, who had just completed a 24-hour shift in his Brooklyn firehouse with Squad 1, apparently raced to the scene of the tragedy. He has been missing since. Born and raised in Westbury, L.I., Mr. Fontana moved to Park Slope with his wife, a lifelong West Brighton resident, when they married. Mr. Fontana met his future bride while he was a student at the C.W. Post campus of Long Island University, Brookville, L.I., where he earned a fine arts degree in sculpture. He later became a set designer for Sarah Lawrence College, Bronxville, N.Y., in order to be closer to her while she pursued her education. He was intensely involved in the Staten Island arts community, and spent several days here each week, working on his art. Mr. Fontana recently completed an installation, a work combining painting and sculpture, in the Newhouse Galleries at Snug Harbor Cultural Center, Livingston, with his mother-in-law, Joyce Malerba-Goldstein. The work will be exhibited in the fall. Previously, he had designed the set for "The Glove Connection," a play by his sister-in-law, Leah Gray, which was performed at Snug Harbor in 1994. Mr. Fontana was also an amateur historian, and spent five years researching firefighters who died in World War II. As a rescue worker, he participated in flood relief work in Texas and rescues in the aftermath of a California earthquake. Mr. Fontana shared a love of rock climbing with his 18-year-old brother-in-law, Luke. "He was one of the most talented and unpretentious people I have ever met," said Mrs. Malerba-Goldstein. In addition to his wife, Marian, surviving are his 5-year-old son, Aidan; his mother, Antonia Fontana; his four brothers, Brian, Dennis, Hank, and Edward, and his two sisters, Ellen Fontana and Victoria Johnson. There will be a memorial service Oct. 17 at noon in St. Francis Xavier R.C. Church, Brooklyn. Rest in peace David Fontana. The world is a better place because you were a part of it. Thanks for also participating in this project. Like you I did not know the person assigned me, but I do now. What an amazing young man. :( Thanks for posting this Myra. I've studied English sinse Autumn. As a result annual house price growth dipped to 7.9% - the first time the yearly growth rate has fallen below 10% since 2001. "As we move into the summer, the housing market will become a bit more liquid," said James Carrick, an economist at ABN Amro.